Wolf Video Poker is a program that attempts to offer it all: practice play, strategy chart generation, slot club calculations, and more. However, upon first glance the software seems dated and primitive compared to Video Poker for Winners. We bought the Wolf Video Poker product to test it out and see if it really offers all of the features it promises on the website. Read on for our full review of the product, and our verdict if it is worth the $49.95 they're asking. As you can see, I held the three card straight flush instead of making the correct play, which was to hold the four card flush. One the fly training is my favorite way to learn new games, because I can gradually learn rules and refine my game play while actually playing. It makes it really easy and fun to learn perfect strategy for over 100 major games. Most other software programs only offer a dozen or so games, so Wolf Video Poker has the edge there. You can choose to play only penalty hands. This is a great way to learn how to sort out those pesky three card royals when you have penalty cards. 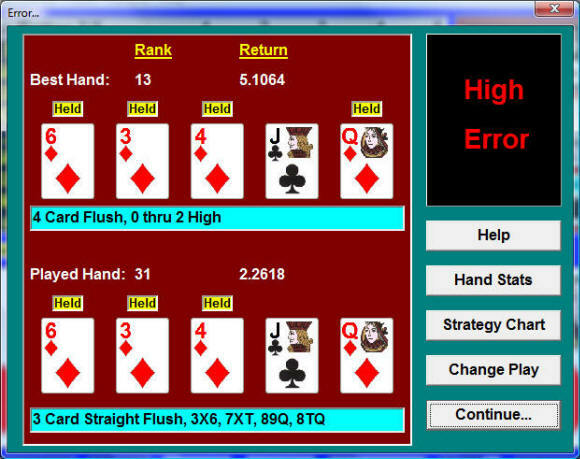 Another great tool that Wolf Video Poker offers is the option to play hands over and over again with fixed cards. For example, you could plug in Ah-Kh-Th and then play the hand over and over again with two other random cards. This is a good tool for figuring out hands that vary greatly depending on the accompanying cards. Another outstanding tool that Wolf Video Poker offers is the ability to calculate the value of individual slot clubs, and how they effect the return percentage on different video poker games. All you have to do is plug in the numbers and the program does the rest. 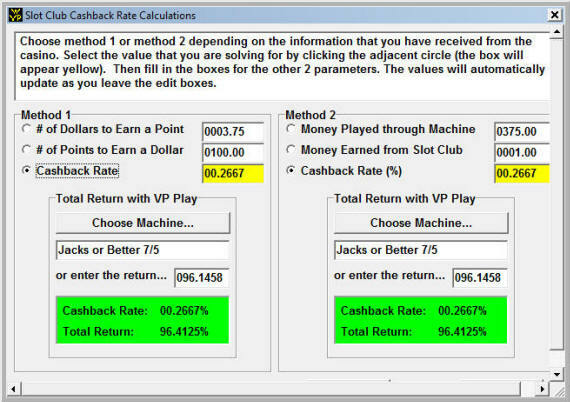 As you can see there are two methods for calculating the cashback rate depending on what information the casino gives you. The slot club calculator is unique and extremely useful for the serious video poker player. Although Wolf Video Poker looks like it's fifty years old, the tools and features they offer are absolutely outstanding. In my opinion it is well worth the $49.95. If you'd like to order,	head over to WolfVideoPoker.com.